Dr. Mae Fong Family Dentistry offers our patient form(s) online so they can be completed in the convenience of your own home or office. 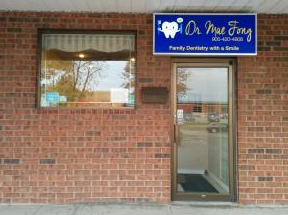 Welcome to Dr. Mae Fong Family Dentistry Your Dentist in Pickering, ON. Located in Pickering, Ontario, Dr. Mae Fong Family Dentistry is dedicated to maintaining long-term dental health and providing high quality services for patients. We are a clean cozy neighborhood office providing gentle dental care to families in the Durham region since 1995. We welcome patients from kids to adults to seniors. We are extremely proud to have watched kids grow and families prosper. From general dentistry to preventative dentistry to cosmetic dentistry to periodontal gum maintenance, we are happy to be at your service. Our patients are our most important asset. We strive to develop long lasting and healthy relationships with all our patients. As well, we believe good people refer good people; so your referrals are welcome and appreciated! 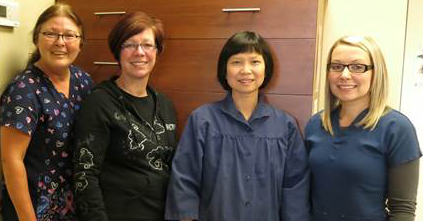 At Dr. Mae Fong Family Dentistry in Pickering, Dr. Mae Fong and our entire dental team are committed to satisfying your dental needs with a warm smile. Patients come to our office because they know they will always receive personalized care using the latest advances in the dental field. To ensure a safe and clean office setting, we practice strict infection control measures and the newest steam-based surgical-grade instrument sterilization techniques, as well as WHMIS procedures. Dr. Mae Fong Family Dentistry is focused on providing gentle dental care with individualized attention. With patients from seniors to toddlers, our practice is committed to providing a comfortable and happy environment. We make it our priority in taking the time to alleviate dental fear and understanding your personal concerns. When our patients look forward to dental visits, it translates to a lifetime of healthy teeth and gums. We are located in the Lookout Point Plaza at 750 Oklahoma Drive, just off Whites Road and Bayly Street. We have cable TV and music in our operatories and free WIFI. To facilitate our patients, we accept assignment of dental insurances. If you're looking for the most thorough comprehensive dental care in a friendly and relaxed atmosphere, we invite you to contact Dr. Mae Fong Family Dentistry in Pickering at (905) 420-4808 or email us at [email protected]. We look forward to meeting you and your family, and helping you smile brighter!